+ What is the general admission cost? Grutas Tolantongo is a waterpark that offers natural attractions such as: Caves, Thermal tunnel, thermal water river, pools of different depths, thermal pools, waterfalls, suspension bridge (gazer), hiking, camping areas, zipline (additional cost) and beautiful landscapes. The general entrance is $140 MXN By Person. The entrance includes all the aforementioned attractions, except the zipline It cost ($200.00 MXN). Children over 5 years pay the full ticket, children under that age do not pay. The ticket is for 12 hours, not for 24, the validity is from 7 am to 8 pm. We are in service every day of the year. We have 3 sections of lodging in the park and 1 more external it. We have 4 camping areas El Huamuchil, La Ortiga, La Huerta, El Paraíso Escondido) within the park. The first 3 are close to the turquoise river and the last one is near to the thermal pools. + What I need to rent a room or camp? To stay in the hotel or in the camping area, it is necessary to pay the entrance tickets to the park on the day you arrive (Day 1) and also the tickets for the next day (Day 2) , or alternatively for the number of days of stay that will be in the park (Day n) plus the cost of the room or the cost of the camping tent rent per night. Example: If you arrive on Saturday morning and wish to stay in hotel or camp until Sunday, you must pay a total of 2 park tickets per person, and cover the night of lodging or rental cost of the camping tent on Saturday night. That is to say, to pay tickets for Saturday and Sunday plus the cost of the room or house of campaign. + Do you make excursions? We offer only discount tickets to groups of excursions from 40 people or more. + Can I enter with my pet? Sorry, But you can't enter to the park with any types of pets. + Is the place suitable for people with disabilities? Only in a percentage of the place is suitable for people with disabilities, because due to the inclination of the place it is a little complicated to have access with ramps in all the attractions. 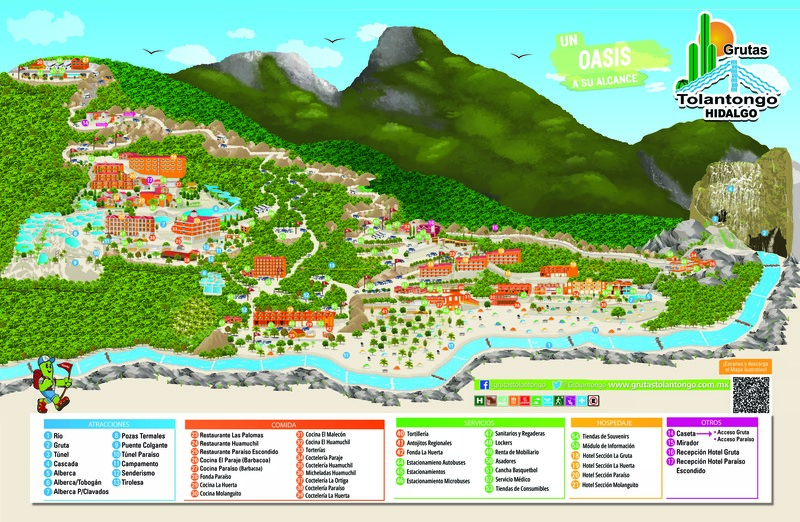 The most recommended area would be: "The Hidden Paradise" . It is essential to always be aware of your family member to avoid incidents. + What attractions we have? What can I visit in both areas? + Do you have packets or promotions? For the moment. We don't have any type of packages on promotions. We sell and rent all by separated. You can check costs here. + What can I do if I can't find a room available? The first option we offer in case of not finding available rooms is the camp, we rent all the campaign equipment, we sell blankets, mattresses, inflatable mattresses, as well as firewood for your campfire. The area is very safe and has showers, changing rooms and toilets, as well as nearby restaurants. The camping area is near the turquoise blue river of thermal water, so the experience is unique. ONLY CASH: All payments within the park are made in cash, in Mexican pesos and US Dollar. + Where is located Grutas Tolantongo? We have showers, changing rooms and toilets in all areas. + Can I enter with food and drinks? For alcoholic beverages it is recommended to drink in moderation and keep order. It is not allowed to enter the park with gas tanks. You can only consume food and drinks in the camping area We rent chairs and tables for your convenience.